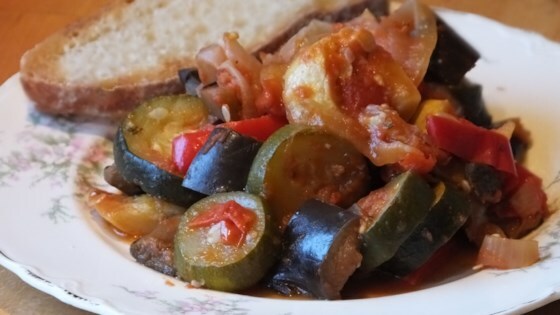 "In France, we make ratatouille all year round and serve it with white rice, or as a side dish for fish or meat. It is naturally vegan and tastes especially good with sun-ripened vegetables." Pour olive oil in a large pot and heat over high heat. Add onions and garlic and saute for 2 minutes. Lower the heat and add eggplant, zucchini, tomato puree, herbes de Provence, salt, and pepper. Cover and simmer for 30 minutes. Remove the lid. If there is still a lot of liquid, continue cooking for another 30 minutes uncovered. If the amount of liquid looks right, put back the lid and cook for 30 more minutes. My children are not very fond of the eggplant skin, so sometimes I peel the eggplants for this dish.